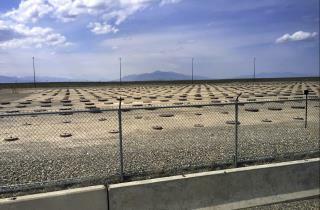 (Newser) – A university has admitted to misplacing a gram of weapons-grade plutonium, and federal authorities want to fine them $8,500. Per CNN, Idaho State University has not been able to account for the bit of radioactive material since 2003 but, nonetheless, believes it was properly stored at a licensed disposal facility. However, with no documented proof, the US Nuclear Regulatory Commission said Friday it must propose the fine. Dr. Cornelis Van der Schyf, vice president for research at the university, blamed partially completed paperwork from 15 years ago as the school tried to dispose of the plutonium. "Unfortunately, because there was a lack of sufficient historical records to demonstrate the disposal pathway employed in 2003, the source in question had to be listed as missing," he said in a statement to the AP. The fine is nothing but anyone powdering the material can create an extreme health hazard as it only takes a microgram to cause radiation poisoning. $8,500 fine for a gram of plutonium? is that the going rate for these things? We had a few lapses of inventory at OU when Carter started our Nuclear Engineering program mostly to benefit his Iranian buddies in the early 80's. We had two different reactors at the NEL. And he was issuing student visas to iranians like Pez. But then came the hostage taking and his ultimate demise. And OU decided it did not want to be a part of the training of middle east terrorists. I was glad to see them lose their visas under Reagan. These losers always started their first class with,"I hate America".